Hard Candy Look Pro Bare It All Foundation Stick is a new foundation and concealer stick that the brand recently launched with a $7 budget friendly price. It seems like a lot of brands are launching foundation sticks for Spring/Summer and I’m quite ok with that as I find them very easy to apply, travel-friendly, and just an overall good choice for swiping on and going. I don’t wear a lot of foundation so quick swipe on and go works perfectly for me as I pay more attention to concealing under my eyes versus worrying about my foundation application which I tend to go more natural and sheer with. I feel like foundation sticks provide that sort of easy, light coverage without a lot of application effort. I happen to be of the mentality that foundation is a splurge item as I find drugstore ones or cheaper ones aren’t that great. However, when I noticed Hard Candy Pro Bare It All Foundation Stick I didn’t hesitate picking it up. Why? Because Hard Candy has proven again and again and again they do know how to make affordable and high quality foundation and concealer formulas. Hard Candy Glamoflauge Mix‑in Pigment Makeup Drops and Hard Candy Heavy Duty Glamoflauge Concealer are just two such great products. I’m having a love hate relationship with Hard Candy Look Pro Bare It All Foundation Stick at the moment. This foundation comes in a chunky dual-sided barrel that holds the foundation stick on one side and a flat brush on the other for blending. I thought the brush didn’t really helping the blending process at all since the foundation formula was so hard and I literally felt like I was scrubbing my skin to blend it out. Don’t quote me but I think this launched in January so it has been on the shelves a few months. I read a few reviews during that time period that called it creamy and easy to blend. I just purchased it so it has been sitting on the shelves for a few weeks and I do wonder if maybe if the sticks I purchased somehow went off. They stick was really dense and not creamy in the least. I was able to swipe it down my cheek but it sort of hurt since the formula was so damn hard. The finish is obviously a matte one and blending was difficult do to the dryness of the product but surprisingly it didn’t cling to my drier areas at all. Even more surprising was the fact that once I blended it into place my face looked brighter and flawless. Not to mention it really lasts long! I applied it in the morning and went all through the day and into the evening without any fading issues. One you get it blended, which is a bit difficult, it has a really seamless look that hugs skin. I think you can see how it just becomes on with your skin in my swatches below. They do dub this a foundation and a concealer but honestly, I don’t think they are applying you should use it under your eyes. Perhaps merely as a spot concealer should you like as I’d never recommend it for under eye use with this sort of texture. It does deserve to be mentioned that the shades seem to oxidize during the application process. I purchased Light/Medium and Medium and both applied darker on my skin than what appeared in the barrel. Lucky enough, Light/Medium was a good pick for me but sadly, there aren’t a lot of options here. I believe there are nine shades to choose. I gotta admit, the formula is awful but for some odd reason it worked out for me. The application is terribly, the texture is horrible, but the wear, finish, and completed look MIGHT be worth checking this out. I liked how bright and smooth my skin looked when wearing this plus the awesome wear time. Maybe just maybe I might buy this again if I run low. 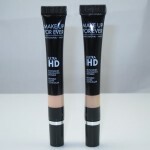 Hard Candy Look Pro Bare It All Foundation Stick is available at walmart.com. I remember when Hard Candy was sold at Sephora, and their blue nail polish was every grunge girls dream. However, I admit to buying HC at the demon store, and the formula as changed for all their products. But, I will give this a whirl. It’s cheap enough. Btw, a question. What do I do with all the products that I buy that I only use once and for whatever reason I don’t like? My friends are literally overflowing with products that I can’t or don’t want to use. I hate throwing a full bottle of lotion in the garbage, or any other cosmetic for that matter. Thanks, love. Have an awesome day. I remember those days too! 😀 HC at Walmart is nothing like what it was back in the day! I tend to donate them! Some go to my mother’s senior group, others I donate to a girl’s org that takes gently used makeup which is used for prom night, etc…if you look online or visit your local town hall or community hall you might be able to find info about orgs that are looking for donations. Hi Muse, which shades did you do the swatches, please? I’m sorry I’ll correct that and label them. It’s light and light/medium!